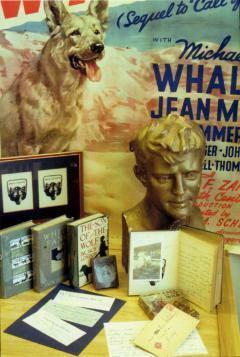 In 2014, Palmer Andrews donated his unique Jack London collection to the University Library. Mr. Andrews has been an avid researcher of Jack London’s life and writing for years. Mr. Andrew’s desire with his collection has long been to help students and future scholars of Jack London get to know the man behind the public persona, with an emphasis on his social views, politics, and philosophical ideas and how they changed over his lifetime. It is important to Mr. Andrews that the collection be a valuable resource to the researcher. Mr. Andrews encourages exploration of London's novels and stories to experience the magic of London’s writing. Hands on accessibility and the backdrop of the Sonoma County community Jack and Charmian London called home, were among the reasons he selected Sonoma State University as the repository for his material. This fine collection is strongly focused on Jack London through the lens of historical context as experienced through his friends, peers, and family. The collection includes early editions of London’s novels and magazine first appearances, and first person accounts in the form of books, magazines, letters, and papers from friends, contemporaries, and influential people in Jack’s life. The Jack London in Context Collection is housed in the Library’s Waring Jones Reading Room. I started reading and collecting Jack London over fifty years ago.I really can’t recall which book of London’s I read first, but one of the many things that fascinated me was London’s belief that through books, one could become educated on any subject. I think this is what initially drew me to Jack and made me want to know more about him. Jack London was an adventurer, writer, sailor, and journalist. In my study of London, I have discovered that to really get to know the man, beyond the public face, it is vital to look at his correspondence with the people he called friends. A simple note, question, or response Jack wrote to a friend would give me an understanding of his interests, politics, and philosophical ideas and how they changed over time. It has been very important to me that my collection be a research collection rather than just a set of his writings. While the collection houses London’s novels, articles, plays, and essays, as well as biographies of London, it also includes first person accounts in the form of books, magazines, letters, and papers from friends, contemporaries, and influential people in Jack’s life. To the researcher combing through the collection, I hope that it kindles your interest in learning more about Jack London. I know that you too will discover something new about Jack London, his contemporaries, and his time. No, but items must be viewed in the Waring Jones Reading Room accompanied by Library personnel. The Library owns all items in this collection but does not own the copyrights. Some materials are in the public domain and others are protected. See Rights and Reproductions and consult with Library personnel for assistance on copying.